We do know that homo sapiens have been in Malaysia for a long time. 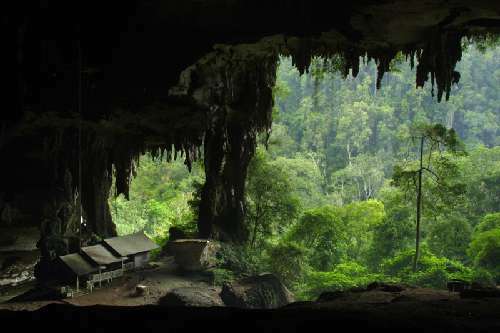 The oldest known evidence of human habitation is a skull from the Niah Caves in Sarawak dating from 35,000 years before Christ. On the peninsula, stone age tools and implements from about 10,000 BC have been found, and some archaeologists suggest that they were left there by the predecessors of the Negrito aborigines - one of the earliest groups to inhabit the peninsula. We also know that about 2,500 years before Christ a much more technologically advanced group migrated to the peninsula from China. Called the Proto-Malays, they were seafarers and farmers, and their advances into the peninsula forced the Negritos into the hills and jungles. 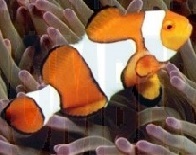 History's periodic waves of cultural evolution, however, soon created another group, the Deutero-Malays. They were a combination of many peoples - Indians, Chinese, Siamese, Arabs, and Proto-Malays - and they had risen by mastering the use of iron. Combined with the peoples of Indonesia, the Deutero-Malays formed the racial basis for the group which today we simply call the Malay. Blown across the Bay of Bengal by the reliable winds of the southwest monsoon, they arrived in Kedah sometime around 100 BC. Whether or not the civilization they encountered there was the one from the ancient chronicles will probably never be known, but it is certain that the sailors considered the trip lucrative. From that point on, and ever-growing stream of Indian traders arrived in search of gold, aromatic wood, and spices. Goods were not the only items exchanged in the peninsula's ports: the Indians also brought a pervasive culture. Hinduism and Buddhism swept through the land, bringing temples and Indian cultural traditions. Local kings, who sent emissaries to the subcontinent, were impressed by the efficiency of the Hindu courts, and soon began to refer to themselves as "rajahs". They integrated what they considered the best Indian governmental traditions with the existing structure, and historians typically refer to these kingdoms as "Indianised kingdoms". Today, the most visible example of the early Indian influence is in the Malay wedding ceremony, which is very similar that of the subcontinent. The Portuguese constructed a massive fort in Malacca - A Famosa - which the Dutch captured in turn in 1641. This would give the Dutch an almost exclusive lock on the spice trade until 1785, when the British East India Company convinced the Sultan of Kedah to allow them to build a fort on the island of Penang. The British were mainly interested in having a safe port for ships on their way to China, but when France captured the Netherlands in 1795, England's role in the region would amplify. 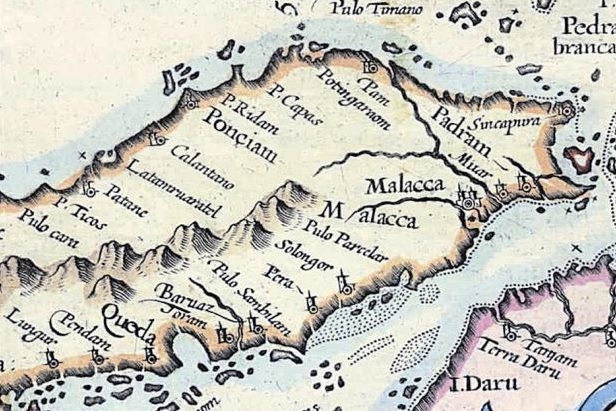 Rather than hand Malacca over to the French, the Dutch government in exile agreed to let England temporarily oversee the port. The British returned the city to the Dutch in 1808, but it was soon handed back to the British once again in a trade for Bencoleen, Sumatra. The Dutch still largely controlled the region, however, and in 1819 Britain sent Sir William Raffles to establish a trading post in Singapore. These three British colonies -Penang, Malacca, and Singapore - came to be known as the Straits Settlements. While the European powers played their regional chess game, the local Malay sultanates continued on their own affairs. After Malacca was captured, the new Muslim trading center became Johor, then later on Perak. Both the Minangkabau Immigrants from Sumatra and the Bugi people from Celebes immigrated to the peninsula in large numbers, leaving lasting cultural contributions. In the late 1860's, a number of Malay kingdoms began fighting each other for control of the throne of Perak, causing enough of a disturbance in the region to inspire Britain to intervene and essentially force the Malay rulers to sign a peace treaty known as the Pangkor Agreement in 1874. The treaty, unsurprisingly, gave Britain a much greater role in the region - a role it would need in order to maintain its monopoly on the vast amount of tin being mined in the peninsula. Coupled with the power of the White Rajas in Borneo, Britain ruled over what was then called Malaya until the Japanese invaded and ousted them in 1942. During this time, large numbers of Chinese fled to the jungle and established an armed resistance which, after war's end, would become the basis for an infamous communist insurgency. In 1945, when W.W.II ended, Britain resumed control again, but Malaya's independence movement had matured and organized itself in an alliance under Tunku Abdul Rahman. When the British flag was finally lowered in Kuala Lumpur's Merdeka Square in 1957, Tunku became the first prime minister of Malaya. 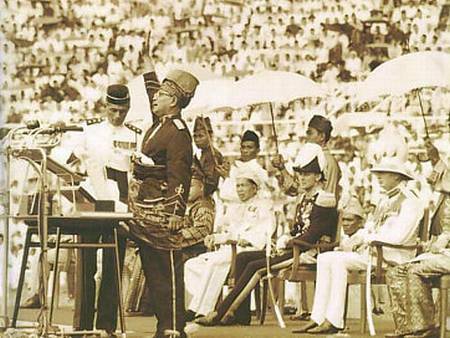 Independence ceremony in Merdeka Stadium August 31, 1957.